In April of 2003, at age 67, Ken Moreau transformed his passion for fishing into a successful boat-building business. At first, all Ken really wanted to do was create the kind of boat he had always imagined for fishing trips with his wife. No one predicted though, that Ken’s vision for the perfect boat would be exactly what other people were looking for as well. As soon as Ken’s boat hit the water, folks started looking and asking where they could get a boat just like that one. And before he could cast his line in the water, Ken was in business. It’s easy to understand why so many people are attracted to Ken Moreau’s boats — they’re light, portable, durable and hand built by Ken out of wood. Better still, they’re powered by oars, so high fuel costs and engine failures are never an issue. Ken now offers a variety of boat styles and popular options like a canvas canopy (that he sews himself!). 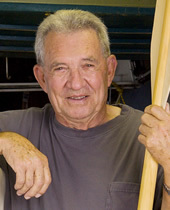 Ken Moreau built that first boat in 2003 with no prior boat building experience. But Ken had over 40 years of experience as an electrical engineer and designer, so he approached this project in the same thoughtful, systematic manner. He researched wood types, density, stress, angles… he cut, glued, sanded… he tested and retested. The result of his efforts? A waiting list for new orders. Ken’s life experience has helped him create things that make life more enjoyable for others. And for Ken, the 2-3 weeks he spends transforming some wood into a boat is most satisfying when he sees how the work of his hands can visibly bring joy to someone else. Now 73, Ken is enjoying the freedom to do the things he always wanted to do, the things he never had the time to do before. And that includes the joy of crafting a bayou-bound piece of happiness for others. Ken Moreau… Peoples Health Champion.